This paper is motivated by our beliefs that (1) economics does matter in world oil markets and (2) today's applied models either entirely neglect or (at best) only partially incorporate well-known economic fundamentals. We know of no applied model preceding ours that fully embodies the fundamental microeconomics of both depletable resources and industrial market structure (specifically dominant firm cartel theory) that characterize the world oil market. The great demand for oil price forecasts has resulted in extensive discussion of possible behavioral and structural relationships to describe this jerky market. On the supply side, much attention has been focused on the inner life of OPEC. Is it or not a cartel? Is it a cartel with a competitive fringe? How strong is the tension between high and low absorbers? Are the depletion policies derived from myopic cash requirements or from long-term optimization schemes? Since 1973 the global economy has been going through a difficult transition period. 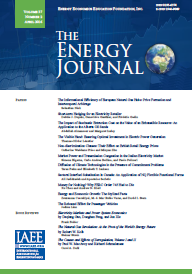 After a long period of growth, characterized in part by low oil prices and increased reliance on production in a few large oil-exporting countries, it is moving toward a new equilibrium characterized by substantially higher energy costs and an energy supply base more diversified in terms of fuels as well as country import sources. This transition period is far from over. Although developing countries use only a small percentage of the world's oil (about one-sixth), their economic performance has been adversely affected by higher energy costs. Most developing countries import oil and have been caught in a dilemma of increasing foreign debt and/or reducing economic growth. On average, in 1981 the oil-importing LDCs spent 38 percent of their export earnings on imported oil, and domestic energy investments accounted for about 25 percent of aggregate investment.These percentages may increase because of industrialization plans and diminishing supplies of traditional fuels for household and agricultural use. More than 98 percent of Israel's primary energy resources are imported, most of it as crude oil, the rest of it as coal, placing the country in a most vulnerable and awkward position. The sharp increases in crude oil prices in 1973 following the Yom Kippur War and in 1979 has increased the country's economic burden, contributing to its increasing deficit in the balance of payments and staggering inflation rate. Perhaps here more than anywhere else, a balanced energy policy is most crucial for security and well-being. Such policy would allow diversification of primary energy resources by using more alternative and renewable resources supplemented by a variety of ways of managing demand and controlling peak-load growth. Gasoline demand, which represents almost a quarter of world petroleum consumption, has been the focus of a considerable amount of econometric work since the 1973 oil embargo. However, researchers and policymakers when considering this work are confronted with a bewildering array of elasticities and results that come from a variety of data sets and model types. This survey stratifies these elasticities for statistical analysis and development of summary elasticities, identifies basic issues, and illustrates a strategy for summarizing studies that should be useful to policymakers and researchers in any area of applied work. Because space prohibits discussing all of this work, this survey is limited to those studies that have estimates for gasoline demand, vehicle miles traveled, and miles per gallon. The U.S. Interior Department periodically offers Outer Continental Shelf (OCS) tracts for lease at seated bid auction. The bid variable typically is the bonus, a sum paid by the lessee at commencement of the lease. A tract is awarded only to the high bidder. However, the seller often deems even the high bid insufficient, rejecting it and withholding the tract for possible laterauction. Will Mandatory Conservation Promote Energy Efficiency in the Selection of Household Appliance Stocks? This paper estimates a nested logit model for space heat and water heat choice using data from the National Interim Energy Consumption Survey (NIECS) by the Department of Energy in 1978. (See Dubin, 1983) for references to the data set and a detailed discussion of procedures used to prepare the data for economic analysis.) The use of micro-level disaggregated survey data to estimate discrete choice models of heating, ventilating, and air-conditioning (HVAC) systems has been very recent, but one can find a few related models in Dubin and McFadden (1984), Brownstone (1980), Goett (1979), Hausman (1979), and McFadden, Puig, and Kirschner (1977). One of the virtues of the structure developed here is that it has been embedded successfully in a larger micro-simulation system (the Residential End-Use Energy Policy System (REEPS)) for purposes of policy forecasting (Goett ). As a result of the distortions that have beset natural gas markets in the wake of partial wellhead deregulation under the Natural Gas Policy Act of 1978 (NGPA)-the most visible problem being the existence of increased prices amid a glut of deliverable supplies-concern has mounted about whether the natural gas pipeline industry will perform in a socially efficient manner in the long run when field prices are completely decontrolled.In addition to transporting natural gas from the field to the city-gate, interstate natural gas pipeline companies have traditionally performed two functions. Granted private carrier status by the Natural Gas Act of 1938 (NGA), they both purchase gas shipments in upstream markets and resell them in downstream markets as well as match up gas producers who have available supply with distribution companies and wholesale end-users (direct industrial consumers and electric utilities) who have unfilled demand. In other words, as private carriers gas pipelines not only provide a gas transmission service but also assume the twin roles of gas merchandiser and broker. Energy policy analysts (Hausman , Hartman , Houston , Hutton , and Olsen ) increasingly rely on some notion of life-cycle costing for predicting how consumers will choose among alternative energy-using durable-good investments. These techniques have been important for understanding and analyzing the household purchase of new, relatively-untested appliance technologies (such as solar water heaters and more efficient refrigerators), new energy sources (such as solar photovoltaics), and capital-intensive conservation investments (such as increased home insulation, storm windows, and water heat wraps). In all of these cases, consumers face options in which a higher capital cost will purchase lower operating costs over the life of the particular pieces of equipment. We assume consumers evaluate these energy-using durables as they would any other investment. They compare and discount, over the life of the investments, the costs and financial benefits of alternatives and choose the option(s) offering the largest expected benefit. The Hopkinson rate consists of an energy charge for every kilowatt-hour of electricity a customer uses, plus an additional demand charge, a peak-demand charge on the maximum usage during the month. Historically, industries in North America have generally been charged a Hopkinson rate for electricity use. In 1983, for example, 97 percent (see Blinder ) of the publicly owned electric utilities in North America had demand charges in their commercial/industrial rate structure, whereas only 11 percent had time-of-day rates. However, with the exception of papers by Corio and Trimnell (1978) and Veall (1981), the focus of empirical research on industrial firms (like the focus of research in the residential sector) has been on examining the impact of time-of-use rates (e.g. Chung , Chung and Aigner , and Panzar and Willig ).